this is shocking and rather disturbing news to learn of. 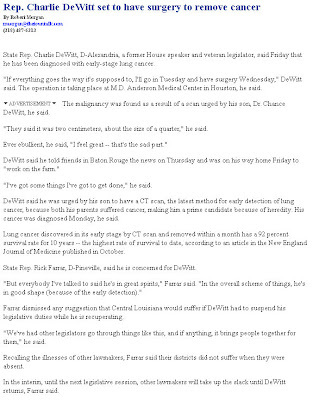 although, we have always considered state representative charlie dewitt to be a consummate louisiana good ol boy politician, we certainly wish no harm upon him. we pray that rep. dewitt makes a 100% recovery and return to good health.